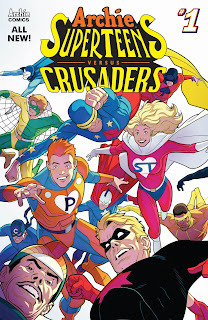 Certainly one of the more... unusual... takes on Archie and his friends is the Superteens, which was a short-lived-and-rarely-revisited stint from the '60s where the gang somehow became superheroes (with vaguely-defined powers). But hey, superheroes are hot right not (at least at the movies), and Archie Comics has a bunch of Golden, Silver and Modern Age characters just gathering dust (the Mighty Crusaders, for example), so why not trot them out and take a shot? Happily, this issue puts the focus on fun, as an evil substitute teacher at Riverdale High School hatches a strange scheme, which draws the attention of the Crusaders and the Superteens (natch, since it's their home turf). So Archie becomes Pureheart, Betty becomes Superteen (is the group named after her? ), Veronica (who didn't have a hero incarnation in the original stories) becomes Miss Vanity, and Jughead becomes Captain Hero. It's all fast and breezy and fun - a nifty burst of nostalgia for geezers like me, and it should be fun for new readers, too.